My summer vacation for this year is now over. Lord Crumb has returned to the land of the Doctor Who and Downton Abbey, and I’m back at work, trying to remember what the heck I was working on before I left. It was really sad to see him leave because we had a lot of fun together and I didn’t want to kill him by the end, like I usually do when I spend that much time around someone constantly. But other than all of those things, we spent a lot of time eating out/ordering in and generally relaxing while tinkering, watching TV shows/movies, or playing games. Lord Crumb fixed my Xbox360 (once we finally found all of the required parts) and figured out how to stream Steam games to two mini-PCs he brought with him. Some of Gauntlet and Brothers: A Tale of Two Sons were played, and we managed to complete Shadow Puppeteer while my brother laughed at the many, many times we fell to our deaths. It was a wee bit frustrating at times. Lord Crumb played The Boy while I played The Shadow and we both thought that the other person had the more difficult role. Got Lord Crumb to Mastery 20 so he could get his free wings too. Then got him to Mastery 30 so he could participate in the hourly challenges. I can’t even remember how high I got my mastery, something in the 50s I believe. Levelled my fae trickster, ice sage, and boomeranger to at least 10 in the process of getting him that level of mastery (while he levelled his knight, gunslinger, and shadow hunter). Bought the Power Pack and Arcanium Expedition Pack because the former is very useful and the latter includes a headcrab, a companion cube, and a steamboat. Unlocked the rest of the classes (including the new tomb raiser). My candy barbarian is now maxed at level 20, and so is Lord Crumb’s neon ninja. Maxed out my ringcrafting (my gardening was already maxed and Lord Crumb maxed ringcrafting a while ago). We figured out how fishing worked and we each caught enough rare fish to craft a lava fishing pole. We both managed to grab a couple launch giveaways: the Insanisteed from MMORPG.com and the Curse Kami. Picked up the Jelly Knight and Battle Caterpillar mounts from the Treasure Isles vendors just because I had enough flux/glim. Lord Crumb seems to be a magnet for mount drops which led to him making a pirate corgi, an ice cat, and a neon cat. He also gave me a couple of his drops so I was able to make a fiery corgi and a steampunk cat. Gathered enough materials to build a Sky Realm portal in our home world. At least we would have if I hadn’t foolishly spent a bunch of faerie dust on gardening stuff, which then led me to trading flux for more dust to get enough back. Found out that the only dungeons in the Sky Realms have no enemies and you just have to collect radiant shards, so they can be completed with any class and are super easy. Crafted a runecrafting bench and started Lord Crumb on getting his runecrafting up. It made more sense for us to pool our resources and have just one of us learn it to start. It uses a lot of mats from the Sky Realms but honestly, it’s the blank scrolls that we’ll have the hardest time with. Mostly because the easiest way to get them is to deconstruct recipes and we love collecting those instead. 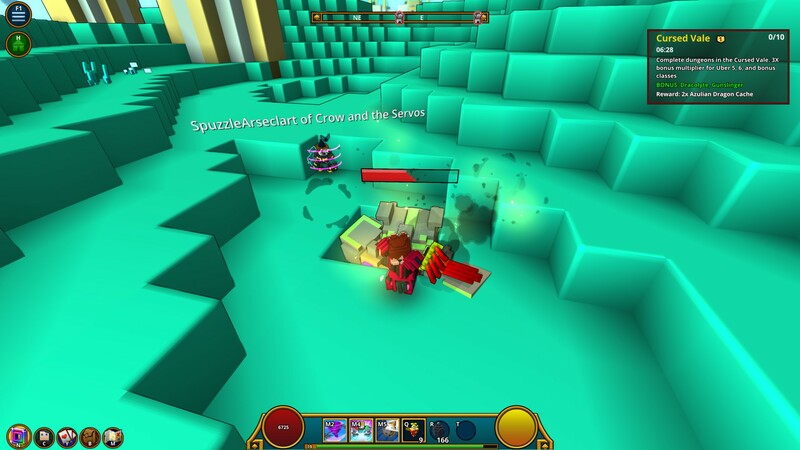 There’s also the fact that Trove finally launched on July 9 (as well as going live on Steam). We were in Fargo at the time so we didn’t experience much of the actual launch but when we got back, we did experience the queue. And have been experiencing it ever since. I only wish I had taken a screenshot of the time it said 700+ minutes. It seems that a heck of a lot of people found it on Steam and really liked it. So much so that it’s currently 6th of the Top 10 games on Steam Charts. Despite that, this vacation was one of the best I have ever had, if not THE best, mostly because of the great company. I’m already looking forward to November when I’m hoping to visit Lord Crumb and enjoy my first trip outside of North America.